Click Here To See Daredevil #163 Comic Book! This one is truly a "grail" cover! 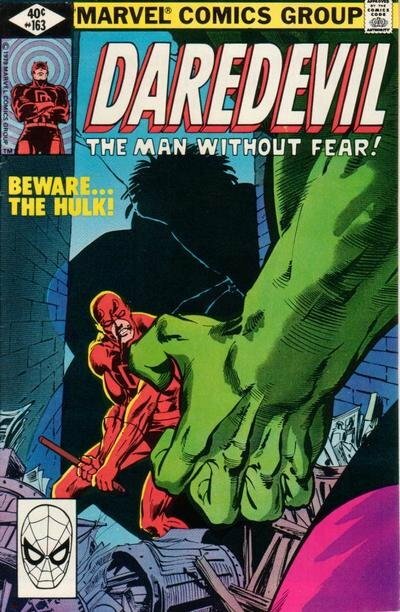 Frank Miller's original cover artwork here to Daredevil #163 features the memorable image of Daredevil bracing for battle with the Incredible Hulk in an alley, as the Hulk (and his HUGE shadow) get closer and closer to Daredevil! 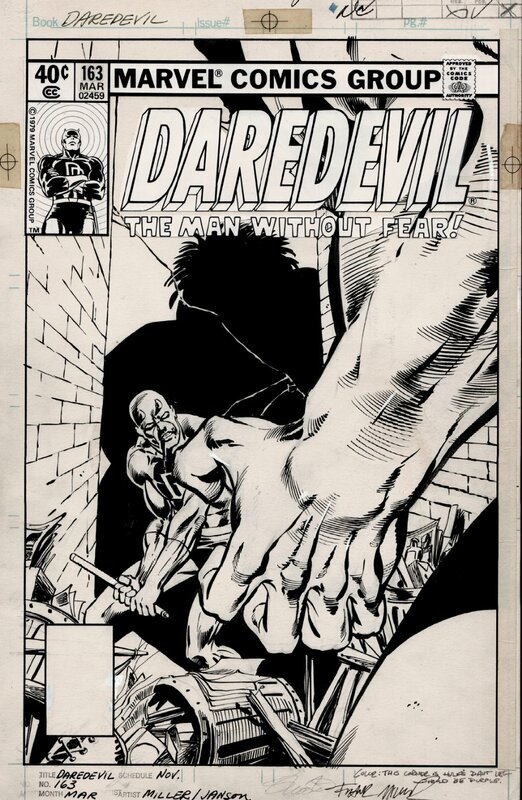 Rarely do you see any Daredevil cover art from Frank Miller's acclaimed run surface for public sale, and when they do, they are never this good! Even this issue's comic book is selling for a premium within the run due to the Hulk crossover and the magnificent cover brilliantly executed by this celebrated artist. The stark contrast in figuration between the two popular Marvel mainstays (hard to refer to them both as heroes when the Hulk is the antagonist in this one) and skillful use of shadow creates a sense of Daredevil as underdog, standing strong, alone yet customarily fearless against the odds..with a busted up bloody jaw as he holds his billy club with both hands! Inks are by Joe Rubinstein, who a couple of years later would finish Miller's pencils on the acclaimed Wolverine Limited Series! Frank Miller's historic run on Daredevil #158-#191 has been considered one of the best comic runs in the history of the medium. The opportunity to own a strong, early "SIGNED" Miller cover (and Jim Shooter signed) from this DD run is no doubt an exciting opportunity for original art collectors! Miller had only been working in comic books for a year when he was given the opportunity to draw Marvel's long-running blind superhero title in 1979. At that time, the title was not selling very well and had been reduced to a bi-monthly title. Miller's UNIQUE approach took off and the book grew in sales every issue. Miller's revamped Daredevil was soon one of the best-selling and most talked about titles of its era. The now acclaimed artist stayed on the title through #191 and later returned as a writer on the historic "Born Again" saga in #227-#233. Miller's work has been reprinted multiple times and has inspired the work of hundreds of later creators! Just an ICONIC cover! Compare this nice cover art to the published comic book in the red link above! ALL art on our website (including this one) are able to be purchased with VERY fair time payments, and trades are always considered towards "ANY" art on our website! Just send us an email to mikeburkey@aol.com and we can try to work something out.